The US and South Korean militaries responded to North Korea’s latest missile test with its own display of military strength, firing live surface-to-surface missiles from rocket launchers, amid renewed tension on the peninsula. Videos posted by the South Korean Ministry of Defense show the US-made Tactical Missile System, known as ATACMS, as well as its own Hyunmoo Missile II. The missiles hit the East Sea on Saturday morning, where North Korea’s ballistic missile is believed to have landed, as part of a live-fire exercise to demonstrate its “precision firing ability,” the US 8th Army said. US Forces in Korea said two missiles were fired from the ATACMS along with two Hyunmoo system missiles. 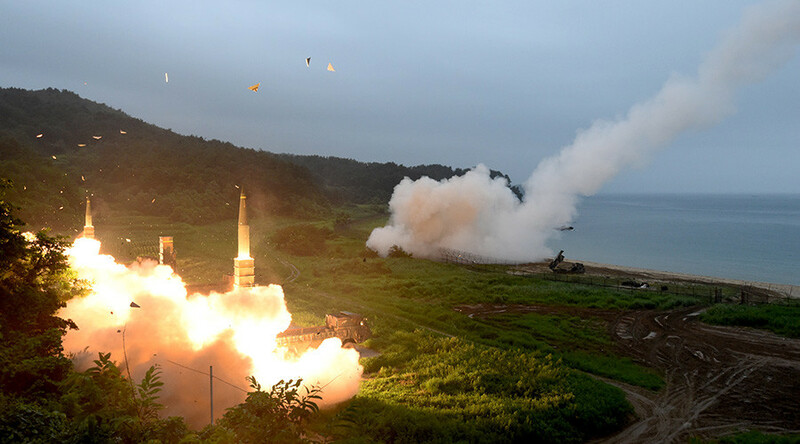 “The systems can be rapidly employed to provide deep-strike precision capability, enabling the ROK-U.S. Alliance to engage a full array of time-critical targets under all weather conditions,” the 8th Army explained on Facebook. The Hyunmoo Missile II is a South Korean-created missile with a range of 800km, Global Security reports. The ATACMS is a guided surface-to-surface missile created by Lockheed Martin, with a range of 160km that can be fired from a range of rocket launchers. South Korea said it would deploy four additional THAAD [Terminal High Altitude Area Defense] anti-missile launchers after North Korea’s test. The THAAD deployment had been delayed after South Korean President Moon Jae-in ordered an environmental assessment.